Cardiff City maintained their Championship promotion push with a comprehensive win over Leeds United. First half goals from Callum Paterson, Junior Hoilett and Sean Morrison and a red card for Leeds' Gaetano Berardi saw the Bluebirds cruise to victory. Anthony Pilkington made the result safe after Sol Bamba's own goal briefly stirred Leeds. Ex-Leeds boss Neil Warnock kept up his 100% record since leaving Elland Road with a fifth successive league win. The Bluebirds remain fourth but are just three points off an automatic promotion berth while Leeds are 10th. Cardiff seized the advantage after just nine minutes in what was a breathless 45 minutes of football. 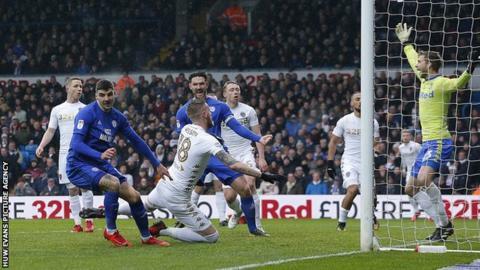 Leeds failed to clear a Joe Ralls corner, allowing debutant Armand Traore to recycle the ball, with Paterson on hand to head home to give Cardiff a dream start. Yanic Wildschut then headed over as the visitors swarmed all over Leeds, with the Norwich loanee one of four January arrivals to make Cardiff's starting XI. Striker Gary Madine, a £5m transfer deadline day capture, led the forward line with Kenneth Zohore dropping to the bench, while Liverpool midfielder Marko Grujic also started, though he could have been sent off in a second half where he and the Bluebirds lost their discipline. It was a splendid start for the Bluebirds but it was sheer luck that maintained their advantage after 25 minutes, with Pierre-Michel Lasogga somehow heading against the crossbar from point blank range. Ezgjan Alioski seemed certain to score with the rebound, but Neil Etheridge produced a sensational save to deny him. It was becoming a frustrating afternoon for Leeds, who have not enjoyed playing South Wales opposition in 2018 after their FA Cup defeat at Newport, and things went from bad to worse when Pontus Jansson was stretchered off. Cardiff took full advantage and just before the interval doubled their lead, when Paterson's scuffed shot turned into an inch-perfect cross for Hoilett, who tapped home. The injury to Jansson meant a large period of time added-on time which proved crucial, because Gaetano Berardi was sent off for a second yellow card for a foul on Madine, a moment fully punished when skipper Sean Morrison headed home Hoilett's freekick. The Bluebirds could not have been more comfortable and that turned into lethargy at the start of the second half, allowing Leeds back into the game when Bamba slid the ball into his own net. However, there was little hope of a comeback and Cardiff's splendid day was capped off when Pilkington tapped home on 87 minutes. "We were just not good enough, especially in the first half, because this is where we lost the game. "I don't think the goals were because of concentration or mentality, because after you see the mentality in the second half to try to change that. "I'm disappointed with the situation [Berardi's sending off], because he already had one yellow card when he went down to the ground, he should have been more intelligent in that situation." Match ends, Leeds United 1, Cardiff City 4. Second Half ends, Leeds United 1, Cardiff City 4. Attempt missed. Ezgjan Alioski (Leeds United) left footed shot from outside the box is high and wide to the left. Assisted by Adam Forshaw. Goal! Leeds United 1, Cardiff City 4. Anthony Pilkington (Cardiff City) left footed shot from the left side of the six yard box to the centre of the goal. Assisted by Callum Paterson. Hand ball by Sean Morrison (Cardiff City). Substitution, Leeds United. Jay-Roy Grot replaces Ronaldo Vieira. Substitution, Cardiff City. Greg Halford replaces Marko Grujic. Marko Grujic (Cardiff City) is shown the yellow card for a bad foul. Foul by Marko Grujic (Cardiff City). Matthew Pennington (Leeds United) wins a free kick in the defensive half. Anthony Pilkington (Cardiff City) is shown the yellow card. Pablo Hernández (Leeds United) wins a free kick in the attacking half. Corner, Leeds United. Conceded by Armand Traore. Attempt missed. Joe Ralls (Cardiff City) left footed shot from the left side of the box is close, but misses to the right. Assisted by David Junior Hoilett. Corner, Cardiff City. Conceded by Ronaldo Vieira. Substitution, Leeds United. Hadi Sacko replaces Pierre-Michel Lasogga. Substitution, Cardiff City. Kenneth Zohore replaces Gary Madine. Corner, Leeds United. Conceded by Joe Ralls. Delay in match Stuart Dallas (Leeds United) because of an injury. Stuart Dallas (Leeds United) wins a free kick on the right wing. Offside, Cardiff City. Joe Ralls tries a through ball, but Gary Madine is caught offside. Attempt missed. Callum Paterson (Cardiff City) right footed shot from outside the box is close, but misses to the right. Kemar Roofe (Leeds United) wins a free kick on the left wing. Pierre-Michel Lasogga (Leeds United) wins a free kick in the defensive half.